Wolfmet specialises in producing complex tungsten collimators using our additive manufacturing process. 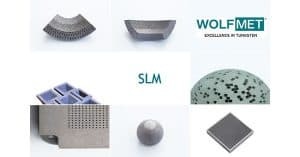 Wolfmet 3D allows the manufacture of high-precision components by building up successive layers of tungsten to achieve geometries which cannot be produced by conventional machining techniques. Therefore the design of tungsten collimators is no longer restricted by the limitations of traditional machining methods. Our additive manufacturing process is transforming what is possible in collimator and shielding design. Our customers have been keen to put it to the test. In addition to standard grid collimators, we have been making complex bespoke designs that deliver better results for our customers. Wolfmet 3D is ideal for components such as collimators and radiation shields in imaging systems, such as CT, SPECT, MR and X-ray. What does Wolfmet 3D mean for you? We will be displaying some of our recent Wolfmet 3D projects at EMIM 2017, Cologne, Germany, April 5th-7th. If you are attending please stop by Stand 16 and learn first-hand how we are changing what’s possible in collimator and shielding design.